Police get frustrated when they pull over a motorist for suspicion of Driving Under the Influence of Alcohol and the driver refuses to submit to a breathalyzer test when the officer requests that they take such a test. The reason behind their frustration is because, in many cases, if they do not have a breathalyzer test result, it becomes harder for the state to prove in Court that the driver was operating a motor vehicle under the influence of alcohol. The Illinois Legislature has clearly given motorists the right to refuse to submit to a breathalyzer test. The Legislature has imposed a severe penalty for refusing to submit to a breathalyzer test when requested to do so by a police officer. If you refuse to submit to a breathalyzer test you will be looking at a mandatory 12 month suspension of your driver’s license. The suspension will kick-in 46 days after you are arrested for a DUI unless you are able to persuade a court otherwise. For several years, police and prosecutors have been trying to get around a motorist’s refusal to submit to a breathalyzer test. For the past several years, Kane County has established “no-refusal” weekends. “No-refusal” weekends were centered around certain events like New Year’s Eve and Fourth of July weekends. Kane County authorities would set-up roadblocks to close off certain roads and stop every vehicle. If the police suspected that the driver of a certain vehicle was Driving Under the Influence, they would request that the driver submit to a breathalyzer test and if they refused, the police would obtain a warrant from a judge who was on the scene to force a blood draw from the driver. If the driver refused to comply with the judge’s order, the driver could be arrested and charged with Contempt of Court. In a surprise announcement, McHenry County authorities announced a significant expansion of the search warrant tactic which takes effect today. This new policy will take immediate effect in the towns of Algonquin, Cary, Harvard, Huntley, Johnsburg, Lake in the Hills, McHenry, Spring Grove and Woodstock. If a motorist in McHenry County refuses to submit to a breathalyzer test, the officer will submit an “e-warrant” request to a Judge. The request will be transmitted over the internet to significantly speed up the time needed to obtain a warrant. The system will allow the officer to communicate electronically with the judge to prove that probable cause exists to force a blood draw from a motorist. If the judge is convinced that there’s probable cause for a warrant, the judge can provide an electronic signature granting the warrant. If the warrant is granted, the motorist will be taken to a nearby emergency room where blood will be drawn and tested for alcohol and drugs. Lake County authorities announced that they are also planning on jumping on the warrant bandwagon. The Lake County State’s Attorney announce that they are also working on a similar plan. 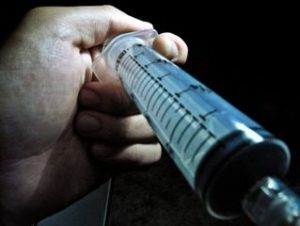 Lake County authorities are planning on working with the Lake County Sheriff to have Lake County Jail medical staff perform the blood draws in the Lake County Jail rather than take motorists to a Hospital Emergency Room. There is no news on when Lake County is expected to roll out this new policy. These new policies will significantly increase the fear and intimidation faced by motorists who are pulled over for a DUI. Motorists in Lake County and McHenry County will no longer have a choice on whether to exercise their constitutional rights. If a motorist chooses to refuse to submit to a breathalyzer test and the officer obtains an “e-warrant” for a blood draw, the motorist will be taken to a local hospital Emergency Room, or the Lake County Jail, and be forced to have blood drawn from their body. This new policy represents a significant increase in the power of the police and the government to control what they want to have done to our bodies. The law already imposes a severe penalty on a decision to refuse to submit to a breathalyzer test. Police and prosecutors are now removing the Legislature’s determination of what the penalty should be for refusing to submit to a breathalyzer test by leaving the motorist with no choice even though be legislature clearly meant for the motorist to have a choice as to whether to submit to a breathalyzer test. In addition, this policy bypasses the intent of the Illinois Legislature. This policy imposes the police officer’s determination of who gets to decide whether a motorist has a right to submit to a breathalyzer test. The Legislature has clearly placed that choice on the motorist. If you refuse to submit to a breathalyzer test then you will be facing a 12-month suspension. Under this “e-warrant” policy, if you refuse to submit to a breathalyzer test you will still be facing a 12-month suspension of your driver’s license. If the police officer obtains a warrant and you are forced to submit to a blood draw, the police and prosecutors will obtain additional evidence that could be used to prove you guilty of a DUI in court while your license will still be suspended for 12-months because you refused to submit to a breathalyzer test. James Dimeas is a nationally-recognized, award-winning, DUI lawyer, with over 25 years of experience handling DUI cases throughout Chicago, Cook County, Du-Page County, Kane County, and Lake County. The National Trial Lawyers have recognized James Dimeas as a “Top 100 Criminal Defense Trial Lawyer.” The American Institute of Criminal Law Attorneys have recognized James Dimeas as a “10 Best Attorney for Client Satisfaction.” James Dimeas has been recognized as a “Best DUI Attorney” and a “Best Criminal Defense Lawyer in Chicago” by Expertise. Recently, the American Society of Legal Advocates named James Dimeas a “Top 100 Criminal Defense Lawyer In the State of Illinois For the Year 2018.” AVVO rates James Dimeas as “Superb”, the highest rating possible for any DUI lawyer in the United States. If you are facing a DUI, you can contact James Dimeas anytime for a free and confidential consultation. You can always talk to James Dimeas by calling him at 847-807-7405. New DUI Policy: Refuse Breath Test, Cop Will Seek Instant Warrant for Blood Test, by Robert McCoppin, The Chicago Tribune, April 13, 2018. Supreme Court Imposes Limits on Police and Motorists in DUI Case, by James G. Dimeas, Chicago Criminal Lawyer, Blog, January 29, 2018.